Joanie's Trendy Quilts : Winner of Winter Blues Blog Hop is. . . . 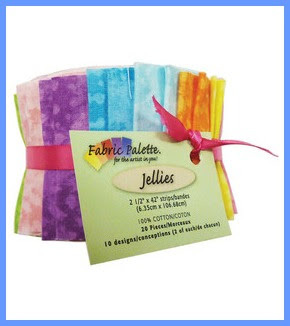 Thank you all who hopped their way to enter to win my Jelly Roll giveaway. It certainly felt like a party all week long meeting new quilters and crafters either by your visiting me or me visiting those who participated in the Quilting Gallery's Winter Blues Blog Hop Party. A special thank you to Michelle from Quilting Gallery for her time to organize the blog hop. I now have the longest readers list ever! And at a time when I finally began to appreciate Google Reader. Last evening I surprised my husband by being awake at midnight. I was having so much fun reading all the new posts from my new quilting followers. Then I learned Google Reader will be no more after June 1st. So now I have enrolled with Feedly and reread your messages via that reader. It was easy to transfer over. Whew! The winner is number 19 out of 132. Her winning comment: "I follow through Google"
In her following message she stated she loved the Spring Batiks. I think they are much prettier than the picture! So if you read this before I email please send me your mailing address! It was so much fun visiting all the blogs for the hop. It was a challenge, but I did make it through all of them. I too, but barely! I was up til midnight Thursday pushing my way to the end!